Using a blend of combinatorics and geometry, we give an algorithm for algebraically finding all flags in any zero-dimensional intersection of Schubert varieties with respect to three transverse flags, and more generally, any number of flags. The number of flags in a triple intersection is also a structure constant for the cohomology ring of the flag manifold. Our algorithm is based on solving a limited number of determinantal equations for each intersection (far fewer than the naive approach in the case of triple intersections). These equations may be used to compute Galois and monodromy groups of intersections of Schubert varieties. We are able to limit the number of equations by using the permutation arrays of Eriksson and Linusson, and their permutation array varieties, introduced as generalizations of Schubert varieties. 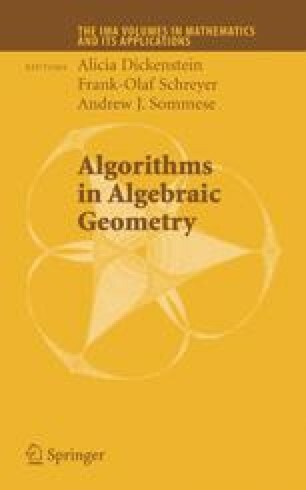 We show that there exists a unique permutation array corresponding to each realizable Schubert problem and give a simple recurrence to compute the corresponding rank table, giving in particular a simple criterion for a Littlewood-Richardson coefficient to be 0. We describe pathologies of Eriksson and Linusson’s permutation array varieties (failure of existence, irreducibility, equidimensionality, and reducedness of equations), and define the more natural permutation array schemes. In particular, we give several counterexamples to the Readability Conjecture based on classical projective geometry. Finally, we give examples where Galois/monodromy groups experimentally appear to be smaller than expected. supported by NSF grant DMS-9983797. supported by NSF grant DMS-0238532.